"It is my sincere wish that this campaign will help end the stigma and encourage those who are suffering to seek treatment." Gary Mendell’s son took his own life in October 2011 because he could no longer cope with the stigma of opioid addiction. Today, Americans are more likely to die from an opioid overdose than a car accident, according to the National Safety Council. Rates of drug-related deaths have increased 300 percent in New York City within the last five years alone. Despite these alarming stats, addiction is still often viewed as a moral failure by those impacted, rather than a medical condition that consumes the brain. That’s why Gary launched Shatterproof -- a national nonprofit organization dedicated to ending the devastation addiction causes families. If your commute runs through one of the busiest parts of the world -- Herald Square in New York City -- you may have stumbled across Shatterproof’s latest drive, "Hope Stems." "As a father who lost his son to addiction, ‘Hope Stems’ gives me so much optimism," said Gary. "This installation will impact how people view those suffering from addiction. "It is my sincere wish that this campaign will help end the stigma and encourage those who are suffering to seek treatment. By changing how we think about addiction we can save lives." 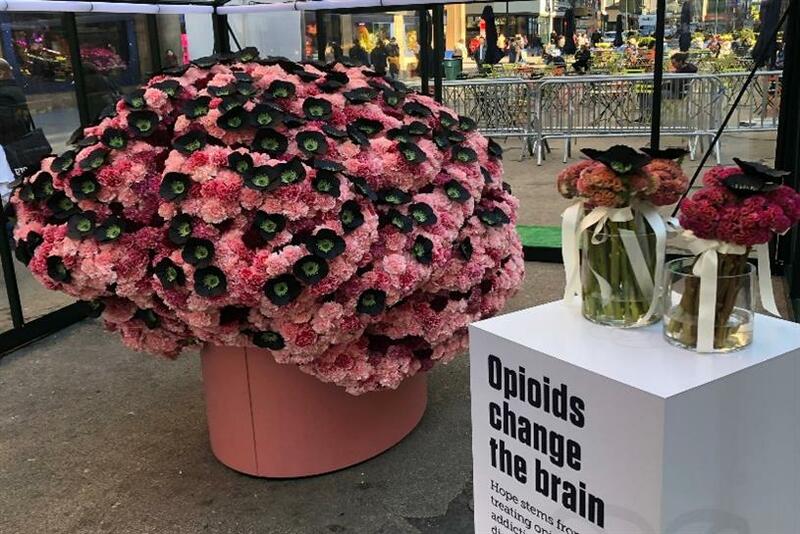 The nonprofit worked with McCann Health to create a giant brain installation made entirely of flowers -- 9,000 carnations and 200 handmade black poppies, to be precise. The poppies depict the effect opioids have on the brain. 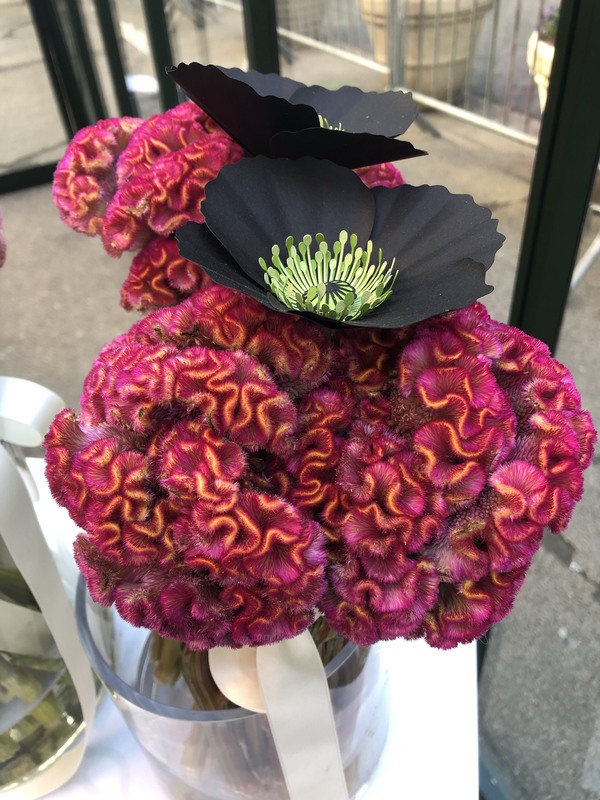 It’s timed to the Macy’s Flower Show and is inspired by florists who have to make funeral bouquets for the 130 Americans who die every day from an overdose. Addiction expert Dr Roy, M.D, M.P. H., explained: "Opioids impact the most complex machine known to human kind – the human brain. Unfortunately, stigma remains a major barrier to care for most people with substance use issues. "As an addiction medicine specialist, I remind people every day of two key points. One: addiction is a chronic medical illness, a disease of the brain, where relapse is expected. Addiction is not a sign of moral weakness or failure and two; most people with addiction, once connected to the appropriate treatment and recovery services, get better." June Laffey, chief creative officer at McCann Health New York, said: "This campaign has the power to not only change the way people think about opioid addiction, but to save lives. "Opioid addiction is not a weakness. It is a disease that changes the brain. There’s science to prove it. With knowledge comes power. With knowledge comes compassion. With knowledge comes hope. "Hope stems from reducing the stigma and speaking with compassion. So let’s all speak with one voice. The more we reduce stigma, the more people will seek treatment and the more lives will be saved." Shatterproof has successfully advocated for policy change in 15 states, broadening access to lifesaving naloxone, improving prescribing practices, and increasing addiction treatment resources. The nonprofit has also been a key advocate for a number of federal addiction bills, including the 21st Century Cures Act and the SUPPORT Act.